When people hear about martial arts (karate, judo, Tai Chi, etc.) linked to the mind, they often times begin thinking about “intense concentration” and mental discipline. Well, they are right because this “art” definitely does require one to have tremendous focus and mental discipline if they are truly serious about mastering their martial art. In the most famous karate movie, “The Karate Kid“, the sensei teacher “Mr. Miyagi” keeps reminding his pupil “Danielson” to focus as, “Karate is all in here!” as he points to his head. What he is really saying is you can’t have one without the other meaning, a perfect mind/body relationship to master the art. Are you someone who is already practicing martial arts and looking to improve? Perhaps you are going to start taking classes this fall/winter as a new activity and hope to grasp it fast and be able to apply it both physically and mentally. If so, then the first place to start is with improving your concentration, as this is the main tenet for the “focus” required for this art form. The key for ultimate success in martial arts is mastering movements which means being able to control your body, as well as remembering how to make the movements properly. Many martial art styles use katas – choreographed and sequenced movements that are sets of moves used for sparring as an art form. Many of these movements are done simply with the body, while others involve using different types of weapons. At the root of all katas and martial art movements is concentration – the memory for how to do it properly which means having the focus to maintain the proper form. Many martial art styles do teach or encourage students to “meditate” which means concentrating. Some believe in the “third eye” which is the ability to see things with eyes closed – in the mind. 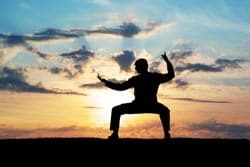 Many successful martial artists practice their kicks, punches, blocks, throws, weapon training and katas in their minds before engaging in actual reality movements. They see with the third eye. Using hypnosis can help you act and react whether in doing actual defense exercises, or katas. Hypnosis helps the mind concentrate and memorize things in terrific detail. Hypnosis helps to create a heightened sense of awareness, through memory and perception. Do you remember the “focus” that Mr. Miyagi was talking about? This is it! Hypnosis also helps individuals block out irrelevant stimuli that could be distracting by creating a sense of tunnel vision. All they are able to see is the task at hand. Through hypnosis one mentally rehearses movements and muscles remember these movements so that when they are called upon by the mind to act or react, they respond instantly. This is called “muscle memory” in the sense that the mind and body become one and this is what martial arts is about. Interestingly, in the Karate Kid, Danielson is taught to “wax on, wax off“, where he cleans up cars. What he is being taught is muscle memory, which his sensei later challenges him to show what he has learned. We all possess this trait! There are a number of self-hypnosis products for improving your results at martial arts and this one here focuses on a common desire to gain heightened awareness to get an edge >>>.